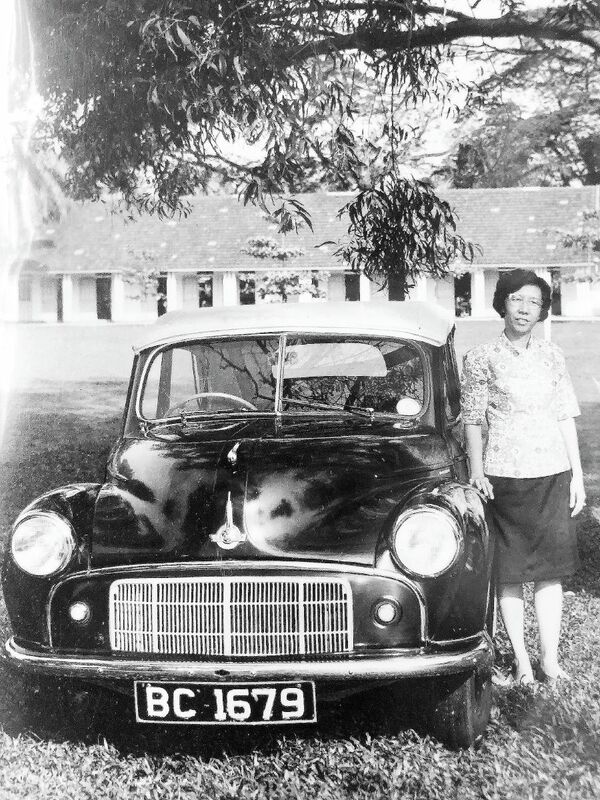 Teacher Jenny Vong with her trusted Morris Minor. A caring and inspiring teacher and a humanitarian. IT was at 5.45am last Thursday when I got the short text message from Yamin — that his mother Jenny Vong had just died. She was 96 years old, a much-loved and respected teacher who gave her everything to her tasks. I took a short ride to Petaling Jaya for her wake, which was held at one of her sons’ house. In the Chinese community, anyone who dies at such an age is much endeared. In the late Jenny’s case, she was an example of someone who had led a full, productive and meaningful life. She passed on just a few days after her birthday. Yamin said her birthday celebration was a very quiet affair because his mother was already very ill then. One of Yamin’s sisters, Yoke May, gave an eloquent eulogy which many felt summed up her mother’s life dedicated to serve all those around her. “She was educated in a convent in Teluk Intan. Later, she went to Anglo Chinese School and passed her senior Cambridge in 1940. She was a good student. In 1941, she was awarded a Federal Scholarship to Raffles’ College in Singapore. Teluk Intan was so proud of her — a remarkable achievement for a small town girl. “When World War 2 broke out, my mother had to flee from Teluk Intan. She was the eldest of eight siblings. Her father was a court interpreter for the British and thus would be targeted by the Japanese so he had to run away from the Japs. “He thought his family would be safe in Singapore. So he crammed them all in a car and drove to Singapore. Unfortunately, Singapore fell. My grandfather was led away together with many other Chinese men and presumably killed. They never saw him again. “So there was my mother just about 16 years old, having to support her widowed mother and seven young siblings. The youngest, my aunt Chui Lin, was only 2 years old. My mother and her sisters had to sell cakes made by my grandmother to survive. My mother had to sacrifice her scholarship to support her family. “Eventually, they all moved back to Teluk Intan before moving out to an estate in Ulu Bernam, where my mother worked as a clerk-typist to support the family. She supplemented her small income by teaching evening classes. “It was then that she discovered her calling to be a teacher. After the war, in 1945, she was encouraged by a good friend to go to Kuala Lumpur for teacher training. “She qualified as a normal trained teacher in 1949. Her salary was only RM60 a month and she gave it all to her widowed mother to support her siblings. “She taught in Pudu English Secondary School in Kuala Lumpur for 31 years. She was a very dedicated and hardworking teacher. She taught me Mathematics in Form Two and Health Science in Forms Four and Five. “She also taught General Science. Her students had excellent results. She was also in charge of the St John’s Ambulance Cadets (extra-curricular activities) where I remember learning First Aid and Home Nursing from her and other officers. I asked Yamin about his mother’s car. He said it was a Morris Minor which she used all the time to do her teaching job and as a volunteer. In 1981, she was awarded the Pingat Jasa Kebaktian by the Sultan of Selangor. On Teacher’s Day, she was awarded the Pingat Jasamu Di Kenang by Jabatan Pelajaran Wilayah Persekutuan. Back to Yoke May: “She was a great mother. She bought us toys and books and this inspired all of us to have a love for reading. Every school holiday, she brought us to Port Dickson. We always managed to get a government chalet because the person in charge was a former student of hers. “As a grandmother, she would come to Malacca during the school holidays and take my children to the beach which was within walking distance. My children loved her for she gave them such happy memories. “She took them for trishaw rides around Malacca town. She bought my daughter a doll’s pram and cradle from England. The pram is in Australia now with my grand-daughter,” she said, with a tinge of nostalgia in her voice. RIP, teacher Jenny! You touched many people’s hearts and made them better people. You will be remembered forever with lots of love and admiration.